Java 9 Reactive Streams contain a set of interfaces that follow the reactive streams specification. This article is a part of series of articles that contain the features in Java 9. here is the list of changes. Reactive programming is based on the Reactive manifesto and primarily deals with asynchronously handling a stream of data . To give you an example, consider a weather mobile App that obtains data from a RESTful API. When the user clicks on a link, the process in the background kicks of a call to an API. However, instead of waiting for the response, the process simply returns back and another thread ‘subscribes’ to the API response. If the API returns an years worth of temperature data for plotting on a graph, it makes sense to render the data that has been obtained so far and continue subscribing for more data. The advantage is that the screen does not become unresponsive and the app can load a huge volume of data incrementally. Before we explain a few other concepts, lets look at how the Java 9 reactive API is different from other reactive APIs such as RxJava. To answer this question, we need a bit of background. Some of the pioneers in reactive programming in java such as RxJava (1.x) and the Reactor project by Spring started developing their own implementation of the reactive manifesto and people soon realized that a common specification was needed. This gave birth to Reactive Streams. The Reactive streams describe a set of interfaces that enable asynchronous stream processing and non blocking backpressure (see below). Since RxJava 1.x could not be retrofitted to follow these interfaces, RxJava 2 was introduced. At the same time, the interfaces were incorporated into the Java specification in Java 9. So the difference between Java 9 Reactive API and RxJava 2 is that the former specifies interfaces that follow the Reactive Stream discussions whereas the later implements those interfaces and scores of other methods that allow efficient handling of reactive streams. The whole idea of Reactive Streams is that the stream is handled asynchronously. I.e. the stream destination runs on a separate thread from the stream source. An obvious problem is what happens if the source emits more items than the destination can process? In such cases, backpressure implies that the destination does not accept more items than it can process and somehow signals upstream that it cannot handle more item (or asks for only a quantity of items that it can process). The backpressure has to be non blocking since the act of passing the backpressure message to the source should itself be asynchronous. The interface that joins the Publisher and the Subscriber is called ‘Subscription’. The fourth interfaces is used to process items as they move from a Publisher to a Subscriber and consequently implements both the interfaces. The JDK provides an implementation of the Publisher interface called ‘SubmissionPublisher’. Here’s an example that uses SubmissionPublisher to create a publisher that emit temperature values. 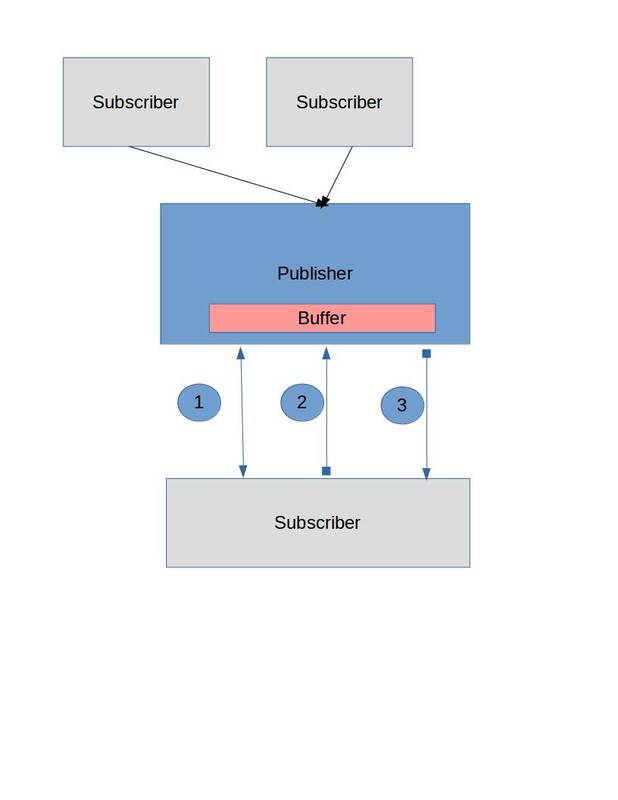 We create a SubmissionPublisher that publishes 9 values to the subscriber. The subscriber requests for 3 values initially and once it receives them, it asks for three more. In this example, we simulate a 0.5s processing time for each item that the subscriber receives. Since the publisher sends all items at once, it will have to buffer some items while the subscriber is processing it. // stimulate an operation that takes 5s. // start requesting more if only 1 or less is pending from the previous request. The SubmissionPublisher has a few other methods too which we will cover in a later tutorial. Java 9 introduced 4 new interfaces for Reactive Stream processing and an implementation of a Publisher. The idea is that more libraries will start adhering to the reactive standard specified by this libraries. The Flow classes in RxJava2 already implement them and so do the Reactor framework by Spring.